With 20 years of corporate litigation experience, and in his additional role serving as leader of Calfee’s Privacy & Data Security practice, Jamie helps business clients resolve critical litigation matters and navigate the complex legal framework impacting the collection, use, and protection of personal information. Throughout his legal career, Jamie has represented both private and public companies in complex commercial litigation in federal and state courts throughout the country. Jamie has successfully applied his significant litigation experience in assessing and minimizing business risks to provide clients, from start-ups to Fortune 500 corporations, with practical legal advice on all aspects of privacy and information security. His proactive approach allows companies to focus on achieving their business goals knowing that their compliance obligations have been met and their regulatory risks have been minimized. In today's rapidly changing information age, businesses face unprecedented challenges in managing and protecting the personal information of their customers, employees, and business associates. Calfee’s Privacy & Data Security group is an interdisciplinary team of attorneys with extensive experience helping business clients of all sizes and in multiple industries overcome these difficult and unique business challenges. Jamie leverages the expertise of a collaborative team of attorneys from Calfee’s Corporate & Capital Markets, Labor and Employment, Employee Benefits, Intellectual Property, Information Technology, and Health Care practice groups. In a global economy, data breaches are rarely limited to one country or geographical area. As a member of the Lex Mundi Global Cyber-Breach Reaction Force, Jamie is part of an exclusive team of cyber-experts who collaborate to provide clients with a prompt, global response to data breaches. Calfee is a founding member of Lex Mundi, the world’s leading network of independent law firms with in-depth experience in more than 100 countries worldwide. Jamie’s commercial litigation experience encompasses a wide range of business disputes, including breach of contract claims, insurance coverage issues, construction disputes, fiduciary duty claims, unfair competition, business torts, trademark infringement, fraud, employment disputes, product liability, and class action litigation. Jamie also has extensive experience defending a global public company in wrongful death, traumatic brain injury, severe burn, and other significant personal injury and property damage cases around the country. Jamie has served as lead trial counsel in litigation pending in more than 25 states. Jamie is active in the community, serving on the Board of Directors of the Children’s Law Center, Inc. for more than a decade, currently serving as a member of the Board’s Executive Committee. He also sits on the Board of Directors of Greater Cincinnati Behavioral Health Services, where he serves as Chair of the Human Resources/Legal Committee. Jamie is a former president of the Northern Kentucky University Alumni Association and a Board Member Emeritus of the NKU Foundation. 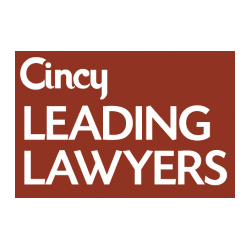 Prior to joining Calfee in 2014 as a partner, Jamie was a Litigation partner with Cincinnati’s third-largest law firm, representing clients in significant business litigation and in privacy and data security matters in Ohio, Kentucky, and across the U.S. Advising private and publicly-traded companies regarding the collection, use, protection, and disclosure of confidential and personal information. Advising companies regarding compliance with the European Union's General Data Protection Regulation (GDPR) and related laws. Advising companies regarding compliance with the California Consumer Privacy Act. Advising companies on domestic and international laws affecting cross-border transfers of confidential information, as well as the necessary content of privacy notices. Preparing and implementing comprehensive information governance and security programs and policies. Advising companies on industry-specific laws and regulations, including the Gramm-Leach Bliley Act and the Health Insurance Portability and Accountability Act (HIPAA). Providing assistance to companies seeking to recover money stolen as a result of sophisticated social engineering tactics. Representing numerous companies in responding to security breaches, including, most recently, two publicly-traded Fortune 500 companies. Preparing and, if necessary, executing incident response plans in the event of a security breach. Overseeing and directing breach response activities, including: forensic investigations, coordination with law enforcement agencies, compliance with all applicable state breach notification laws, compliance with contractual notice obligations, and responding to inquiries from the Federal Trade Commission and state attorneys general. Conducting internal investigations regarding employee theft of confidential information and trade secrets. Represented a public company in a declaratory judgment action against an insurance company; obtained summary judgment resulting in $10 million in insurance coverage for the company. Successfully defended a public company in an action commenced by a Mexican corporation seeking $11 million for alleged breaches of a supplier agreement. Successfully defended a public company in an action in which the plaintiff sustained third-degree burns to more than 20 percent of his body and contracted an almost-fatal MRSA bacterial infection. Represented a public company in a lawsuit against an insurance company for coverage under an additional insured endorsement; succeeded in obtaining summary judgment against the insurer requiring millions of dollars in insurance coverage for wrongful death claims asserted against the company. Represented a public company in separate state and federal lawsuits against two national labor unions for racketeering, extortion, defamation, and trademark infringement. Represented local taxpayers who intervened in a lawsuit commenced by an interest group challenging the validity of an “option” election that resulted in legalizing the sale of alcoholic beverages within the county; persuaded a Kentucky trial court and court of appeals that the election results were valid. Successfully defended a public company in a federal securities fraud lawsuit commenced by a labor union seeking an injunction to stop the company’s annual shareholders meeting. Successfully defended a regional bank in a lawsuit alleging intentional infliction of emotional distress resulting from debt collection practices. Sample Court Decisions: Murray v. Choice Energy, LLC, 2015 U.S. Dist. LEXIS 89913 (S.D. Ohio 2015); AJZN, Inc. v. Yu, 2013 U.S. Dist. LEXIS 2943 (N.D. Cal. 2013); Underground Vaults & Storage, Inc. v. Cintas Corporation, 2013 U.S. Dist. LEXIS 101865 (D. Kan. 2013); Federal Insurance Company v. Cintas Corporation, 2006 U.S. Dist. LEXIS 33369 (S.D. Ohio 2006); UNITE-HERE v. Cintas Corporation, 2006 U.S. Dist. LEXIS 75376 (S.D.N.Y. 2006); Chesher v. Neyer, 477 F.3d 784 (6th Cir. 2007); Coors v. Fifth Third Bank, 2006 WL 2520322 (Ohio App. 2006); Toth v. Mercer County Board of Elections, 2005 WL 991073 (Ky. App. 2005); Bass v. SMG, Inc., 328 Ill. App. 3d 492 (Ill. App. 2002); Herring v. Adkins, 150 Ohio Misc. 2d 13 (Ohio Com. Pl. 2008). Record Enforcement Activity in 2016 for FCPA, FCA, and BSA/AML Violations - Does it Mark an Upward Trajectory or the End of an Era? For nearly two decades, Jamie Ramsey has represented both private and public companies in complex commercial litigation in federal and state courts throughout the country. Relying upon his strong litigation background and significant experience in assessing and minimizing business risks, Jamie provides clients with practical legal advice on all aspects of privacy and information security.